•By heat transfer printing or dye sublimation. •(large)Size: 25"-28"x37"-40" normal size: 27"x39"
•Triat: High-colored, lifelike-visual with high quality. 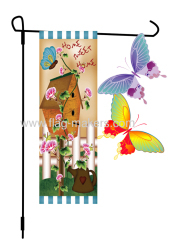 Our company, C&S is a professional manufacture in the field of all kinds of flags, Garden flags,Garden banners, sublimated garden flags, heat transfer printing garden flags, flag poles and brackets for over 20 years. We earn good reputation in this industry through our top quality, reasonable price and elegant customer service. We can produce flags and banners according to your inquiries. If you need more kinds of flags and banners, please contact us at any time!